Sometimes, there’s nothing quite like a golfing getaway with your friends to relax and reboot. If you’re looking for a perfect spot to golf, we encourage you to take a swing at Peninsula State Park Golf Course. This 18-hole course offers spectacular views of Eagle Harbor and rolling greenways that you’d expect to find at world-class golf courses. No wonder it was given 4-stars by Golf Digest! Read on to learn more about the golf course and more ways to enjoy your Door County getaway! The Peninsula State Park Golf Course is just one of the many Door County golf courses that you’ll want to visit. Request your free copy of our Vacation Guide right now and instantly receive a full list of our area’s top attractions, activities, dining, entertainment, and more. The Peninsula State Park Golf Course boasts humble beginnings as a 6-hole course in 1917. By 1931, the course grew to 18-holes and quickly became one of the peninsula’s top places to golf. As you meander through the beautifully sculpted course, you’ll enjoy jaw-dropping views of Eagle Harbor and the Village of Ephraim. You may also catch a glimpse of the stunning Niagara Escarpment, a geological foundation that stretches from Niagara Falls to the Upper Peninsula. Peninsula State Park Golf Course truly is a one-of-a-kind place to enjoy an incredible game of golf surrounded by the natural beauty that makes Door County famous. Peninsula State Park Golf Course is open in April and continues its season until mid-fall. You may choose between the 18-hole course or the 6-hole “short course.” Both courses boast incredible scenery and challenging holes, so no matter which one you choose, you’ll enjoy a golfing experience that will be one for the books. The on-site restaurant at Peninsula State Park Golf Course is known for its tasty hamburgers, BLT’s, fresh sandwiches, and soups. After completing the golf course, this is the perfect spot to unwind, grab an ice cold beer, and enjoy a delicious meal with your friends. The restaurant also provides on-course selections that you can indulge in while you golf. The pro shop is your one-stop-shop for all things golf! From high-quality golfing apparel to must-have equipment, this store has everything you need to look and feel like a golfing superstar. Since the Peninsula State Park Golf Course logo graces many of the products, it’s also a great place to find mementos of your vacation or gifts for your friends and family. Our peaceful and luxurious adults-only hotel is a favorite for couples looking to get away from their day-to-day schedules! It’s no wonder that Egg Harbor has been voted as the Best Small Town in Wisconsin by Fodor’s Travel Magazine. The Ashbrooke’s prime location places you just minutes from all the incredible things to see and do! Guests will also enjoy comfortable rooms and suites adorned with only the best amenities. Our impeccable guest services will ensure that you are enjoying your stay from the moment you arrive all the way until check-out. 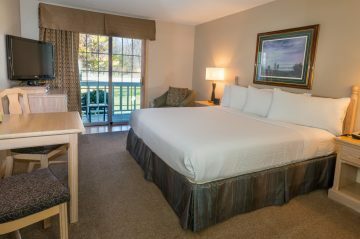 When booking your stay, be sure to ask us about our current specials. We look forward to hosting you here at The Ashbrooke very soon!